"How the Michigan Man Got His Pipe"
The "Michigan Man" as he is called, is the logo of Michigan Suits, "The Peoples Loft" and what he represents has been in debate since he was created back in...well, lets just say back when I was in High School. As a High School age skydiver there were certain rules that I had to abide by if I were to keep skydiving that semester. B's or better or no skydiving till I could prove I was back up to B's or better. So along with my regular classes I took Mrs. Flugal's art class. She was cool 'cuz she didn't care what you did as long as you did a bunch of it. 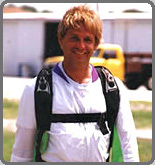 So, of course, I was doing skydivey type stuff which included "The Tracking Skydiver" comics. At first he didn't have a pipe but he was often seen "smokin" Jerry Bird, Captain Hook and Tony DeRosa on the "10 Man Dream Team." At the time I was a member of The Clockwork Banana team. We were the "B" Team of the BeechNuts. Actually I was alternate for the BeechNuts 'till The Banana's offered me the coveted 10th slot. This was the glory slot because, if everything went right, you stopped the clock with your dock. So one day at practice I put my Dad's pipe in the sleeve of my suit, which nobody noticed because I was jammed all the way to the front of the cabin of the small door Beech. As soon as we exited I had it out and in my mouth and still had a great swoop. Nobody noticed at first since they all had their game faces on but when they did, it was big smiles. So that's where the pipe came from. Coincidentally my first below B's or better report card came out at the same time and I was off the team. What brought the average down? Mrs. Flugal's art class! I was at her desk in a flash and when I asked what was up she said, in that condescending teacher voice, was "All you ever do is that skydiving stuff, you need to do other things". It took me almost two weeks to get things up enough to jump again and I did keep my slot. So, recognition should go to Mrs. Flugal. If it weren't for her the Michigan Man probably wouldn't exist. And I can only hope that she is still teaching art at Vicksburg High School in Michigan. She deserves it.